For many people, tea bags are a one-use item. One bag equals one cup of tea. Then the used bag goes in the trash bin, right? 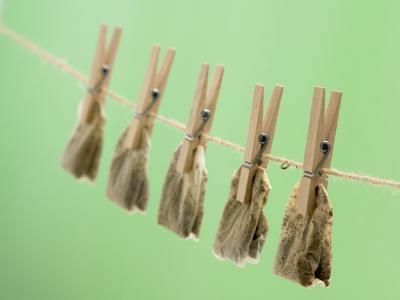 As most tea drinkers will tell you, if you are using tea bags, you can get extra use out of them if you are willing to do so. Most people just chuck them into the trash, compost heap, or recycling bin, but saving them for your next tea is also an interesting idea. Use teabags on your puffy eyes. Warm or cold teabags can help refresh your eyes whether they're achy, tired or puffy. Watch the dark circles disappear. Used green tea bags can help protect and beautify your skin in a number of ways. In fact, they are one of the best home remedies for mild acne. The catechins in green tea have antibacterial properties that help fight acne-causing bacteria. Green tea has anti-aging and antioxidant properties that help improve skin complexion and elasticity. It even delays signs of skin aging, such as sagging skin, sun damage, age spots, fine lines and wrinkles. Plantar warts can be treated with teabags because of the tannin in the tea. On the affected area, place a warm wet teabag for 10-20 minutes, and then leave it to dry naturally. If you repeat this for a couple of days, hopefully the wart will go. Used black or green tea bags can add shine to dry and dull hair. The antioxidants in the tea promote hair growth as well as prevent common problems like dry scalp and dandruff.